This is an unedited Database entry and may contain errors and inconsistencies in spelling. We are working to raise the funds required to complete the editing; should you wish to contribute please visit our Support page. Inskstandish shaped like a brigantine, representing young triton blowing on a conch trumpet. Ink wells, lids and edges decorated with flowers in polychrome. 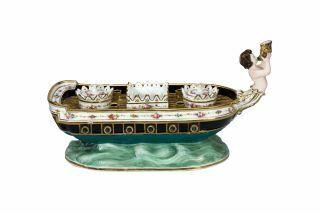 Base of the inkstand is rested on waves, painted in shades of green. 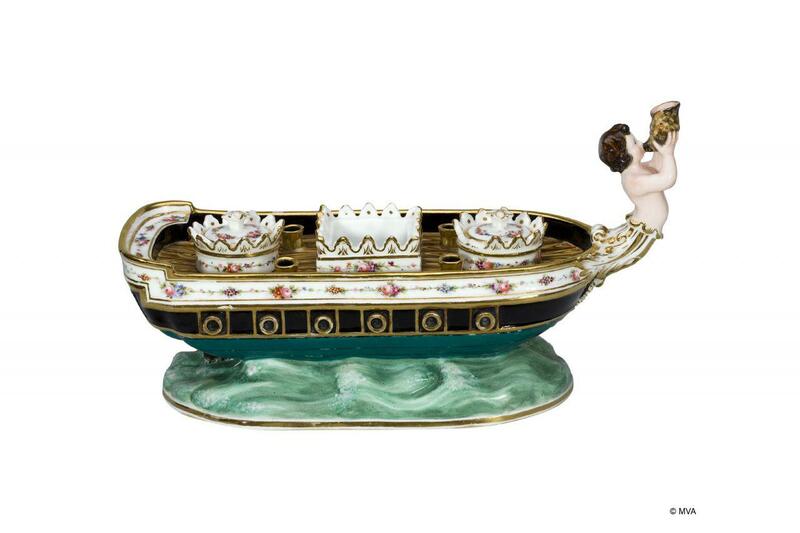 The inkstandish reflects the taste for nautical representations, evoking the national maritime glory, while it introduces delicate floral motifs, in the romantic style of that epoch. Painted by Victor Rousseau, master of painting in the Vista Alegre Porcelain Factory, this object is an example of the early decorative tendencies, distinguishable by the virtuosity of the drawings, intricate forms and artistic experimentation.